Bring only sensible clothes. Your mother, God rest her soul, was not a practical woman. It may be that you have fripperies in your wardrobe. Do not bring them. Our life here is a simple one. 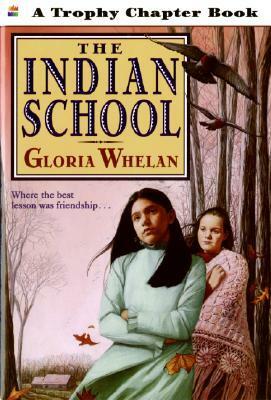 The Indian School tells the story of Lucy, a young orphan who goes to live with her aunt and uncle who run a school for Indian children. When two new Indian children arrive, Lucy forges a tentative friendship with tough Raven, and even her stern aunt becomes fond of Raven’s little brother, Star Face. When the little boy becomes gravely ill, Aunt Emma and Raven learn to work together to nurse him back to health. Pros: After recently visiting an Indian mission in Missouri, I enjoyed this fictional taste of what that life was like. As usual, Gloria Whelan’s writing feels authentic and well researched. Definitely a great book for supplementing history lessons. Cons: While it is not portrayed in a positive light, Lucy’s aunt acts in a condescending manner to her husband. This rubbed me the wrong way at first, but it does sort out in the end to show her aunt beginning to change. Also, Lucy’s growing sense of self-sufficiency and independence sometimes carries a slightly rebellious flavor. P.S. My internet connection may not be functional on Monday so the Guess a Quote this week might be late.